Of course if you’re in Lake Louise and want to ski, you can just stay here: the Lake Louise Ski Area is perhaps the most expansive of the Big 3 ski resorts in Banff National Park. 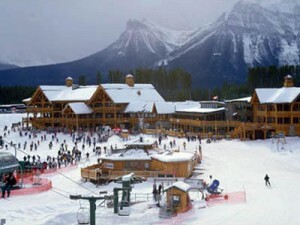 The resort comprises 4,200 acres of alpine skiing above the village of Lake Louise (which lies just to the southwest), spread across the southern slopes of the Merlin Ridge of the Slate Range in the Canadian Rockies, surrounded by Mount Richardson, Ptarmigan Peak, Pika Peak and Redoubt Mountain. Those 4,200 acres contain 139 ski runs and back bowls across four mountain faces; snowboarders have access to all trails including the Showtime Terrain Park. The vertical drop of the runs from the highest point is 991 meters; the longest run is 8 kilometers – there is more terrain here than one could ski in a week, according to the resort’s operators. Of course the easiest way arrange ski outing in Lake Louise, whether you need equipment rental, transportation or lift tickets, is to head to Banff Travel. The adventure specialists there will fix you up for any skiing destination in Banff National Park. Some 25 percent of the ski runs are beginner slopes; 45 percent are considered intermediate, and the remaining 30 percent are advanced, comprising chutes, glades, gullies and remote bowls in some of the most technical terrain in North America – all the black diamond adrenaline you could want. The Terrain Park is designed for skiers and boarders of all levels. There are seven ski lifts, a magic carpet and a gondola servicing the slopes; there is at least one green run accessible from each of these. The Showtime Terrain Park has seen some changes this year as well, according to the Lake Louise Ski Area operators. Covering more terrain than before with a smoother transition between features, in includes jibs, jumps, and rails for every level skier and border. The resort is also constructing a skier/boarder cross coarse. The resort also features four full service day lodges are operational during winter. There are no overnight accommodations at the Ski Area itself, however there are plenty of lodging options including resorts and boutique hotels in the village of Lake Louise, just a few kilometers away. A complimentary bus service operates between Lake Louise Ski Area and the Lake Louise Inn, Post Hotel and the Chateau Lake Louise during the ski season, as well. Of course the easiest way arrange a ski outing in Lake Louise, whether you need equipment rental, transportation or lift tickets, is to head to Banff Travel. 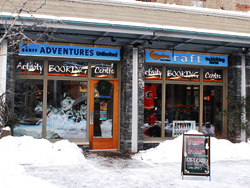 The adventure specialists there will fix you up for any skiing destination in Banff National Park.